It’s been a good, long run for the Bugatti Veyron. Now the 2013 Agera R will take the top spot as fastest in the world. Even before news of a possible Bugatti Veyron SuperSport-beating top speed emerged, the Koenigsegg Agera R was known as a marquee performer in the hypercar category. The Swedish supercar already owned six production car records, the most notable of which was a 0-186mph-0 time of only 21.19 seconds. 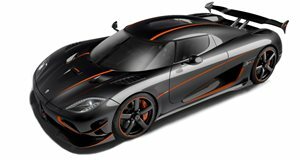 News of a possible 273mph top speed for the 2013 Agera R was met with a fair share of skepticism, however Koenigsegg has said that they will verify the lofty number soon. The new speed would crush the Bugatti Veyron SuperSport recorded production car record of 267.86mph. The 2013 Koenigsegg Agera R features a more powerful version of the 5.0-liter twin-turbocharged V8 found in previous years&apos; editions. Using E85 biofuel, the aluminum-titanium-carbon fiber built engine can put out 1,140hp, while with regular unleaded fuel output is measured at 960hp (up from the previous year&apos;s 940hp rating). The engine improvements come thanks to a revamp of the Agera R&apos;s ECU and a higher rev limit of 7,500rpm. We hope to find out soon if the 2013 Agera R can officially take the fastest-production-car crown back from Bugatti, as the French company dethroned them back in 2005 after only two months holding the title. SSC (known at the time as Shelby SuperCars) held the record for almost three years in between with the Ultimate Aero TT until the Veyron SuperSport hit 267mph in 2010. SSC is planning a comeback into the competition with their Tuatara, said to be capable of reaching 275mph.